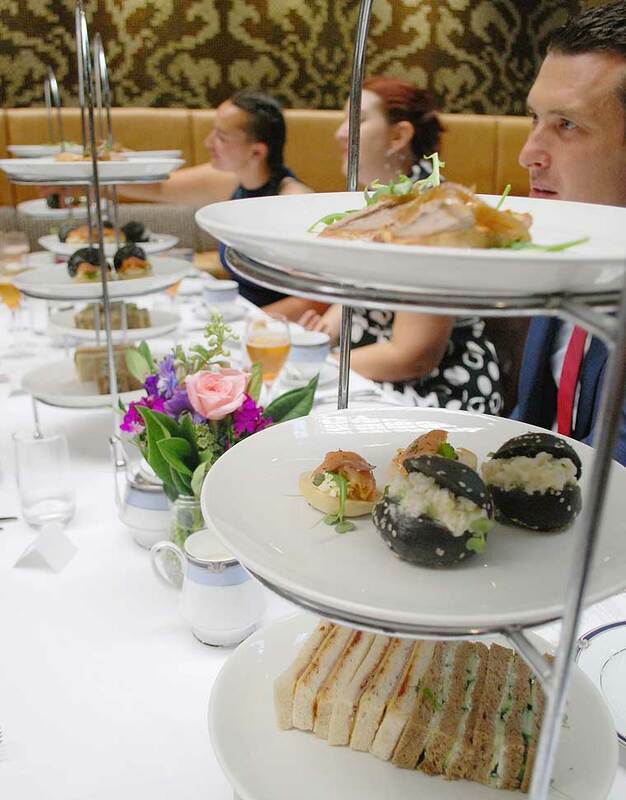 High Tea Society was thrilled to be among the first to sample the InterContinental Melbourne’s new degustation style high tea. Served in the hotel’s light-filled Alluvial atrium, The Clarke Sisters’ Tea Party experience, named after the two high-tea loving sisters who both married the man who commissioned the original Rialto building, is decadent and delightful. It features everything you could want from a great high tea – from the French champagne on arrival, to the classic white table linen, charming service and the appearance of the dessert trolley at the conclusion of the meal. Officially launching on Saturday 3rd March, this multi-course high tea begins with your choice of a glass of Perrier-Jouet Grand Brut or a champagne cocktail complete with cognac and sugar cube. Finger sandwiches and mini broche buns are then brought to the table on traditional three-tiered stands. The offering includes a generous three-layer cucumber sandwich on light rye, which was moist without being soggy and struck the perfect cucumber-to-bread ratio. Unlike most high tea menus, a plated main then follows the sandwich course. Dishes will change seasonally, but we had a choice of a delicate little lamb chop with truffle mash or a mushroom galette with pumpkin puree. Both were very well executed, though the galette was a bit too similar to the sandwiches that preceded it to add much to the overall experience. Scones, the stalwart of any traditional high tea, are brought to your table warm, with strawberry jam, whipped cream and butter. The jam and cream were sufficient, though probably we could have done with a larger serve of the cream. The scones themselves were an excellent size, temperature and texture. Tea, in elegant Noritake china teapots, is offered with the scone course, though you can ask for tea to be served earlier in the meal. Finally, the pièce de résistance of The Clarke Sisters’ Tea Party, is the beautiful polished wood dessert trolley piled high with the best of the best from restaurants and patisseries in the Rialto precinct. With much excitement we chose treats from the trolley, which is wheeled within dangerous proximity of your seat. After making your selection, the desserts are plated up with cream, strawberries or coulis and served to you. The lamington, from nearby three-hatted restaurant Vue De Monde, was light and yet rich, filled with layers of jam and mousse. The lemon tart by Le Petit Gateau is an absolute crowd favourite and a classic, and the white chocolate cheesecake by local restaurant Merchant was creamy with just a hint of tanginess. The Clarke Sisters’ Tea Party from High Tea Society on Vimeo. This venue can also cater for gluten free, vegetarian and food allergy requirements on request. The high tea is not suitable for children; it is reserved for over 16s only. It is clear that much thought has gone in to the InterContinental Melbourne’s new high tea offering. It is traditional, but with some clever nods to the best of modern Melbourne’s dining scene. At $99 per person, The Clarke Sisters’ Tea Party is at the higher end of high tea offerings in Melbourne, but the substantial, degustation style nature of the high tea, paired with high quality French champagne and the opportunity to sample desserts from several of Melbourne’s most loved restaurants and patisseries, makes the experience more than worth it for a special occasion or visit to Melbourne. There are five sittings each day, on Saturday and Sunday only. Bookings: Reservations required, see the link to OpenTable on InterContinental’s website. Hannah is a committed Melbournian, dessert hunter and freelance writer. 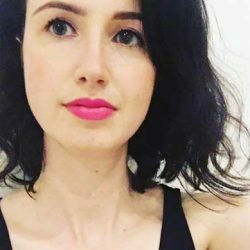 She has written travel and lifestyle pieces for a number of international and Australian publications, and is currently working on her first novel for young adults. As well as writing, she’s worked at a number of charities in Australia and the UK and now consults on philanthropy. Hannah loves baking, reading novels, travel, fine dining, cats, chocolate, dancing and high tea (of course) and she hates scary movies, crusts on sandwiches, rollercoasters and cold weather. The scone is definitely the most important element of a high tea for Hannah, but service and atmosphere also rate highly.